extractor groove, but these have not been a particularly successful compromise. Rimless cases need a method of accurate location in the chamber and this is normally achieved by using a bottleneck case, in which the headspace is determined by the contact between the shoulder of the case and the matching part of the chamber. With straight or tapered cases this becomes more difficult to achieve, so such cases often have a projecting belt just in front of the extractor groove to provide positive location. A few cases have seen service with rebated rims, i.e. with a rim of smaller diameter than the case. This is essential in API blowback cannon (described in the next chapter) which fire before the cartridge is fully chambered, as it allows the bolt and its extractor claw to follow the case into an extended or hooded chamber. This ensures that the cartridge is fully supported at the instant of firing. 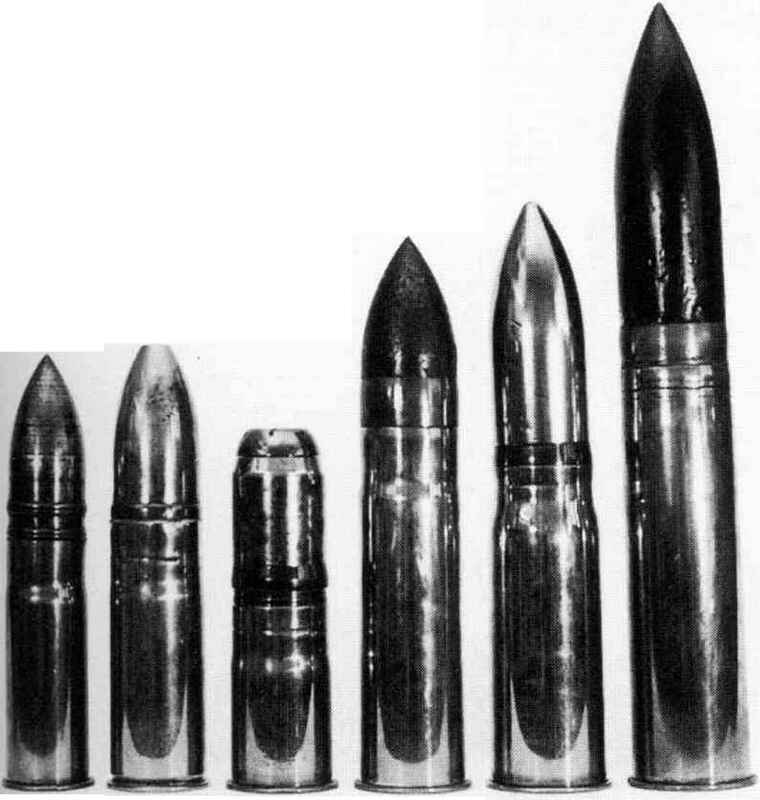 Military cartridge designations are usually given via metric case measurements of the calibre and case length. The .50" Browning is therefore described as the 12.7 X 99, as the calibre is 12.7mm and the case length is 99mm. Note that this is not the same as the overall cartridge length; in the .50" Browning, this is usually around 137mm but does vary according to the length of the projectile. Letters may be added after the numbers to denote some variation from the military standard rimless head. The 20mm Becker is known as the 20 x 70RB because it has a rebated rim (sometimes expressed as RR); the 30mm Aden is called the 30 x 113B because the case is belted; the rimmed 20mm ShVAK was known as the 20 X 99R; the semi-rimmed 1.1" US Naval round as the 28 x 199SR. Note that the calibre measurements are notional; they may refer to the diameter of the projectile, or to the gun bore, or to some convenient figure reasonably close to either. It must therefore not be assumed that a projectile from one 12.7mm cartridge can necessarily be used in another.